How to draw Captain America. 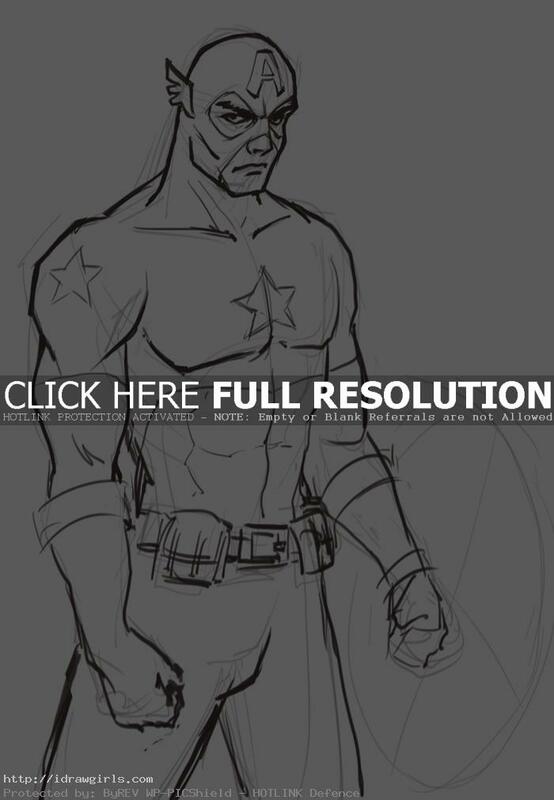 This drawing video tutorial shows you how to draw Captain America. You can find step by step drawing process below if you scroll down. 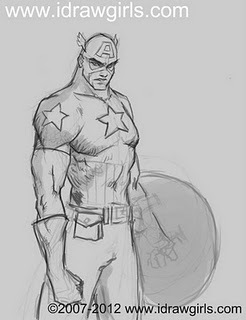 Learn how to draw comics characters.Drawing and sketching Comics Super Hero Captain America. A video series of drawing comic book characters will hopefully help you gain knowledge of anatomy and dynamics in the positioning of the figure and the details. The more you watch and draw, the more you will get better. If you are interested in studying muscles and human anatomy briefly, we do have Drawing body muscle torso anatomy video & step by step and Drawing arm muscles bicep tricep video. Have fun watching. Here is a new updated version of a drawing Captain America tutorial. I felt that the previous video I did has low video and audio quality so I remake the video tutorial just today (March 24, 2014). I hope you will enjoy this one a lot more. A bit about Captain America, he was created by Joe Simon and Jack Kirby. Captain America was the alter ego of Steve Rogers, a sickly young man who was enhanced to the peak of human perfection by an experimental serum in order to aid the United States war effort. Captain America wears a costume that bears an American flag motif, and is armed with an indestructible shield that can be thrown as a weapon. Below are step by step how to draw Captain America to go along with the drawing video instruction.